Buttresses are a feature of many trees in all tropical rainforests. They are woody flanged extensions that radiate outwards from the lower part of the tree trunk and often reach large proportions, sometimes up to 10 metres in height. The evolution and function of buttresses remain somewhat unknown, although to some extent they support the trees weight in shallow soils by taking up strains and stresses if conditions are windy. However, it has been demonstrated recently that the same number of trees with buttresses fell down in cyclones than without. Extending out horizontally on, or just beneath, the forest floor there are shallow root systems in buttressed trees. 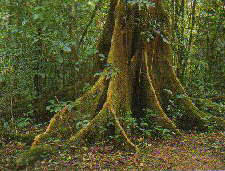 These roots appear to be important adaptations to the various soil conditions in the rainforest. Many rainforest soils are shallow and can easily become waterlogged, and the nutrient concentration is often highest nearer to the surface than at great depths. In these sorts of conditions, shallow roots are more efficient than the common deep tap root system.